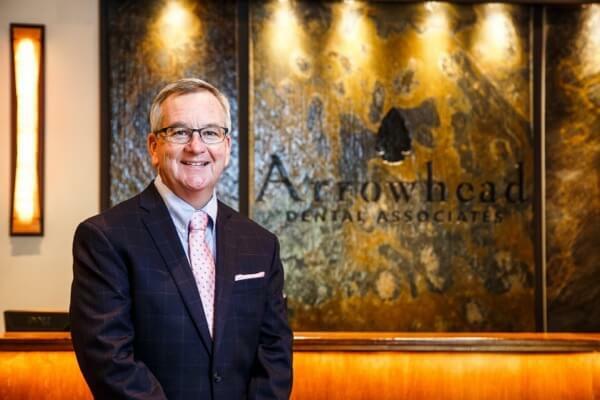 Dr. Richard Walsh recently celebrated thirty years of providing dental care to patients at Arrowhead Dental Associates. He graduated with honors from the University of Massachusetts at Amherst and the Northwestern University School of Dentistry in Chicago. Dr. Walsh then served as a dentist in the U.S. Public Health Service in an Appalachian community for four years before settling in Rhode Island. Dr. Walsh is very involved in organized dentistry and held numerous leadership positions including serving as the President of the South County Dental Society, as President of the Rhode Island Dental Association and as a Delegate to the American Dental Association. He is a member of the International College of Dentists and the Pierre Fauchard Academy, serving as the Rhode Island Section Chair and as a Regional Trustee. Dr. Walsh is a recipient of the “Outstanding Service Award” from the Pierre Fauchard Academy and was selected by Rhode Island Monthly magazine as a “Top Dentist”. His most cherished honor however is the multitude of patient referrals over the years, especially two, three and even four generations of families. Continuing to be very active in local sports programs, Dr Walsh is presently an assistant lacrosse coach at Bishop Hendricken High School. He was one of the founders of both the South County Youth Lacrosse Association and the Rhode Island Lacrosse Association and served as President of both organizations. Dr. Walsh has been honored as the Rhode Island High School “Assistant Coach of the Year” and the U.S. Lacrosse “Man of the Year”. He is an avid woodworker and golfer and also enjoys working on his antique car. A resident of Charlestown, Dr. Walsh and his wife Lisa have two children: Robert, a dental school student, and Abigail, a high school math teacher.